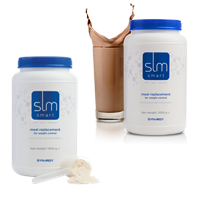 Protein Blend: The SLMsmart Meal Replacement features three protein sources: whey, soy and casein. Proteins contribute to the growth and maintenance of muscle mass. The amino acids from whey protein appear in the blood almost immediately after consumption. Soy protein amino acids appear next followed by casein protein. Together, these power-packed ingredients will leave your body feeling satisfied and ready to tackle the day. 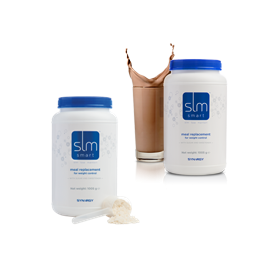 You can reduce your daily caloric intake by substituting breakfast with SLMsmart's Meal Replacement shake. 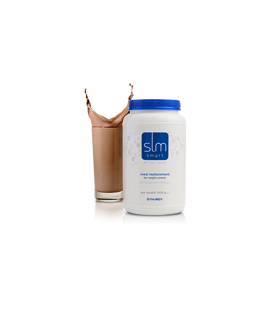 The delicious shake plays the star role in the SLMsmart program. This innovative meal substitute supplies your body with the nutrients it needs to operate at its best while supporting your goal to lose kilos. For amplified weight loss results, substitute breakfast and one additional meal with Meal Replacement. This uniquely designed formula contains three quality proteins that will help keep you satisfied while also supplying your body with 23 vitamins and minerals. Energy Blend: The healthy carbohydrates and fats found in SLMsmart Meal Replacement were strategically formulated to fuel your metabolism and give you the energy that life's demands require. Maltodextrin, canola oil and sunflower oil are just a few of the ingredients that will help you maintain your energy levels, stay satisfied and achieve your target weight. Vitamin & Mineral Blend: Because SLMsmart Meal Replacement contains essential nutrients found in a balanced meal, including Calcium, Iron, Potassium and B Vitamins, it is able to act as an effective alternate to your normal breakfast, lunch or dinner routine.